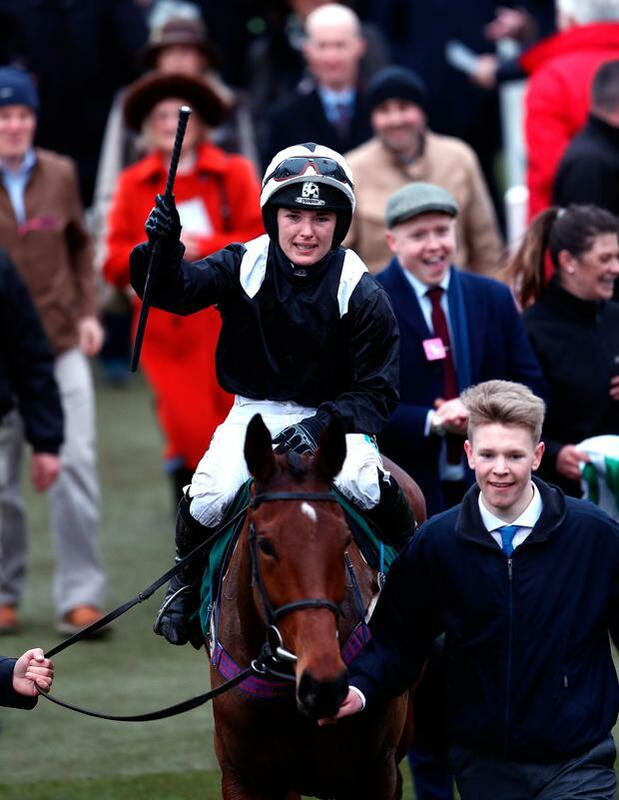 Jockey Katie Walsh on Relegate celebrates winning the Weatherbys Champion Bumper during Ladies Day of the 2018 Cheltenham Festival at Cheltenham Racecourse. Jockey Jack Kennedy riding Veneer of Charm celebrates winning the Boodles Fred Winter Juvenile Handicap Hurdle during Ladies Day of the 2018 Cheltenham Festival at Cheltenham Racecourse. What an amazing day for the Irish on Cleeve Hill. Altior's amazing win in the Champion Chase was the only British winner of the day. Samcro, Presenting Percy, Bleu Berry, Tiger Roll, Veneer of Charm and Relegate took the spoils. Ireland will go into the final two days with a 9-5 lead in the Betbright Cup. A double for Willie Mullins and a treble for Gordon Elliott.